Asian Couture is a perfect place for boys to be always trendy. 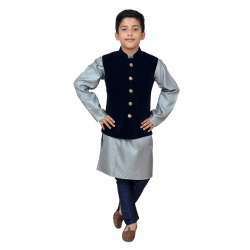 The fascinating collection of Asian Couture's boy collection includes Designer Kurta for Boys which are very beautiful and each boy looks more than handsome while wearing them. This outfit has become very popular and in almost every ceremony or wedding they can be seen. Asian Couture has many exclusive offers for kurta lovers. You will surely get 100% satisfaction both from the various designs and high quality of them. Made from a padded fabricFleece-lined, detachable hoodZip-through fasteningLong zip-off sleevesRibbe..
Top:-made from a cotton blend-crew neckline-button placket to front-long sleeves with ribbed cuffs&n..
GREY POLYESTER READY MADE YOUNG BOYS SHALWAR SUIT Crafted from polyester, this piece features a.. Experience class in this maroon shade embroidered chikankari kurta setEmbroidered chikankari kurta s..
Navy blue kurta set with heavily embroidered neckline in antique thread enhancing its ethnic lookNav.. Originally made for a UK high street retailerSold in store for £20Made from a cotton blendCollared n..